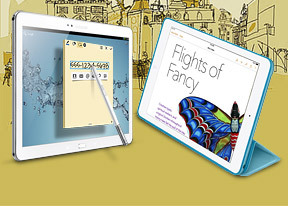 As we already knew, there's no tablet that's good at everything, but both the Apple iPad Air and the Samsung Galaxy Note 10.1 2014 have their shining moments. It's these advantages that will ultimately help users choose one or the other. The iPad Air certainly has simplicity on its side - we've read glowing reports of people who bought an iPad for an elder relative who used it without constantly asking about this or that. That simplicity comes back to bite the Air when it's in the hands of a power user - they quickly realize that it's just a large iPhone 5s. You have to wonder whether there would be room for the iPad to begin with, if Apple was more like the competition and had both a 5" iPhone and an iPhablet. Don't get us wrong, it's a wonderful piece of hardware, thin and light, it has an excellent screen and perfectly optimized chipset. We really appreciated the first-party apps that handle Office documents, photos, videos and music creation. iPads have been popular among the music making crowd due to iOS's lower audio delay compared to Android. The Air also has an advantage in audio quality. If you don't mind Apple's walled garden mentality, the iPad Air works beautifully. The iCloud takes care of syncing, iMessage and Facetime are good at chatting, iTunes is one of the richest content stores, things like AirDrop and AirPlay add value if you have other Apple devices. Most importantly, the iPad Air has a huge advantage when it comes to number of apps specifically tailored to its large screen. So while apple didn't bother taking advantage of the extra estate, its partners grabbed the opportunity, giving the iPad what's certainly one of its most potent weapons. Apple's iron grip is too tight for some geeks though. The custom interface and features of the Samsung Galaxy Note 10.1 2014 can be overwhelming if you try to take it all in at once, but you don't have to. The multitasking features are the most powerful this side of desktop Windows (and we don't mean Modern UI on Windows 8). It's the S Pen, however, that sets it apart from other tablets. The obvious use is for digital artists, who can't take their Wacom tablet and computer on the go. But it can also be good for CAD apps too - AutoDesk has several Android apps to handle things like viewing and editing AutoCAD files, doing calculations on complex designs, planning a home interior and so on. AutoCad 360 is available for iOS too, but the dedicated S Pen support makes it more intuitive and more accurate to use than aiming with your fingers. The S Pen also shines when you need to scribble a quick annotation or a note, as well as searching. The Galaxy Note 10.1 2014 is also better at multimedia - it has better support out of the box, no restrictions for third-party app stores, it's TV-out functionality doesn't require pricy Apple dongles, it has an IR blaster to control additional media equipment. Couple that with the higher-res screen and better speakers, the Note 10.1 is better for watching videos on and off the tablet. Despite the many similarities between the two tablets, it seems that there's a clear dividing line between the Apple iPad Air and the Samsung Galaxy Note 10.1 2014. One can do the job of the other, of course, just not as well - but you wouldn't be paying this kind of cash for "good enough", not after reading this article would you?